After what seems like ages, I'm finally back. And it's good to be back. I was away for a month and spent Christmas with our family in Mumbai, followed by a mandatory trip to Goa and a short stopover at Panchgani. Those of you that follow me on Instagram would have seen some of my pictures there. Those of you that don't, I would love it if you could join me. I'm on IG as @vaztrisha - Do stop by and say 'Hi'. I can't wait to share more about the trip with you. However, that wonderful trip ended with an anti-climatic couple of days of jet lag followed by 2 weeks of a cold, stubborn cough and a couple of days of a fever. Am I glad that's over. I hate being unwell mostly, because that means I cannot be up and about cooking and enjoying the simple pleasures of life. But I'm well and truly glad to be back. One of the first few things I cooked up after getting back on my feet is my beloved Mama's Meatball Curry. I've always loved this curry right from the time I was a little girl. This time when I went to Mumbai, I knew I had to learn this recipe from her. See this is the thing with her recipes, she can whip them up with her eyes closed, but ask her to tell you how she makes it and she may leave out a thing or two, not intentionally of course. So this time around, I got into the kitchen and watched her make it. Yes, I watched her, like a hawk ;) And I'm happy to report that I got the recipe down and made the curry today and I was really pleased with how it turned out. Ofcourse, nothing can beat the food my Mother makes (even though I follow her recipes to the T, her food always turns out better), but this came pretty close, I tell ya. This recipe is a little more intricate than most of the recipes I share here, but it is really easy. 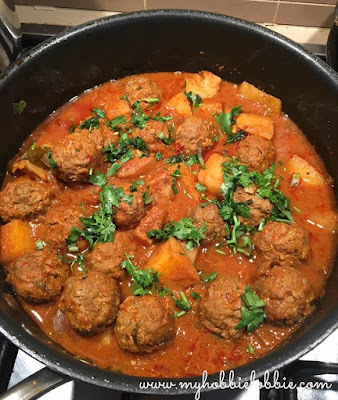 There are two parts to it - one is making the meatballs and the second is making the curry itself. This curry is full of flavor and goes really well with either plain steamed rice or this fragrant Peas Pulao. If you're not in the mood for rice, it goes well with some Goan bread (Poee) or dinner rolls too. Form the meatballs and set aside. Heat the oil in a pan and carefully drop the curry leaves in. Add the onion and saute on a medium high heat till the onions are translucent. Add the masala and continue sauteeing for a few minutes till the raw smell of the masala goes and the oil starts to seperate. Add water to get it to the desired consistency, depending on how thick or thin you'd like the gravy. Keep in mind that the gravy does thicken a little as it cooks. Err on the side of less, you can always add more water as you need. Gently place the meatballs in the gravy. Place the potato cubes in the gravy without smashing the meatballs. Once the gravy comes to a boil, turn the heat to a simmer, cover the pot and let the curry cook. After about 15 minutes, check to see if done. Check and add more salt, if needed. Add tamarind pulp to taste. Once ready, garnish with some fresh coriander and serve hot. **Note: You will be able to find Kashmiri chillies in most Indian shops in Sydney and a few of them carry the Bedki / bedgi variety. If you can't get your hands on them, substitute with any dry red chillies you have on hand. You may then need to adjust the number of dry red chillies used, to regulate the spice level to your liking. This sounds delicious! I bet your mom enjoyed having you watch her cook. I'm glad you are feeling better! Thanks for stopping by and linking this recipe to First Monday Favorites. This looks so good, and makes me want to raid my little curry tree for some leaves. Just have to find some Kashmiri and Bedki chillies next. Hope you continue to feel better. Sid, thanks for stopping by. Kashmiri chillies are readily available at Indian Grocery stores not sure of the bedki. But you could use any red chillies of your choice. These are both dried red chillies - Kashmiri is a mild chilly with more vibrant color and Bedki packs the heat. You could subsitute with cayenne peppers too or use what suits your palette and whats locally available at the time. This recipe makes me want to try my hand at making my own curry! It sounds absolutely mouth-watering!